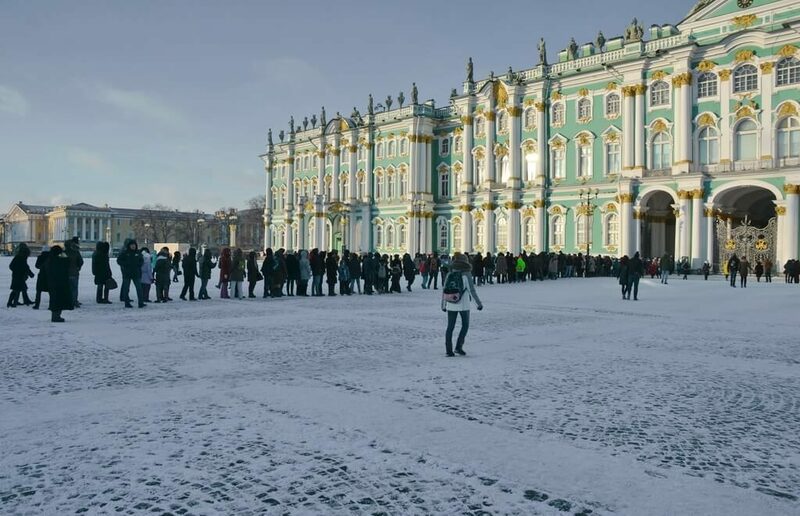 Three major state museums in St. Petersburg — The Hermitage, The Catherine’s Palace in Pushkin and The Russian museum — see visitors lined up in long queues. What’s normal for summer time looks unbelievable under current weather conditions with 20 C under zero. 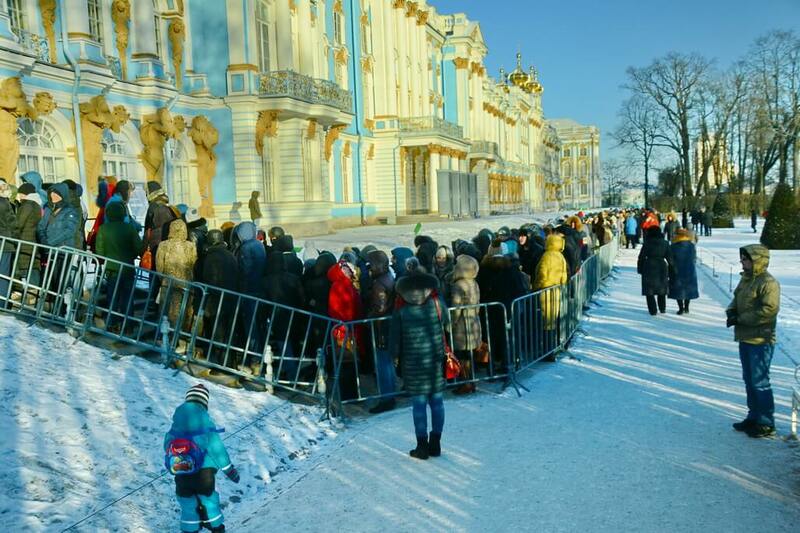 An even half an hour wait may cause light freezing injury (we’ve tested it ourselves), but visitors prefer standing for once-in-a-lifetime opportunity to see works by Aivazovsky or the Amber room. Taking a picture of the queues is not easy as a camera’s battery becomes low very fast. Under minus 20 degrees Celsius, the equipment doesn’t want to work long and prefers to get switched off after 40 shots and 15 minutes. St. Petersburg authorities and non-governmental organizations opened stations where homeless people can come and warm up to avoid injuries or death from low temperatures. The St. Petersburg circle road administration issued a warning that the icy road increases the risk of traffic accidents and limited the speed on the road to 70 km\h instead of ordinary 110. The emergency service and transport companies are on high alert. The demand for heating units and felt boots has significantly increased since the low temperatures period started two days ago. 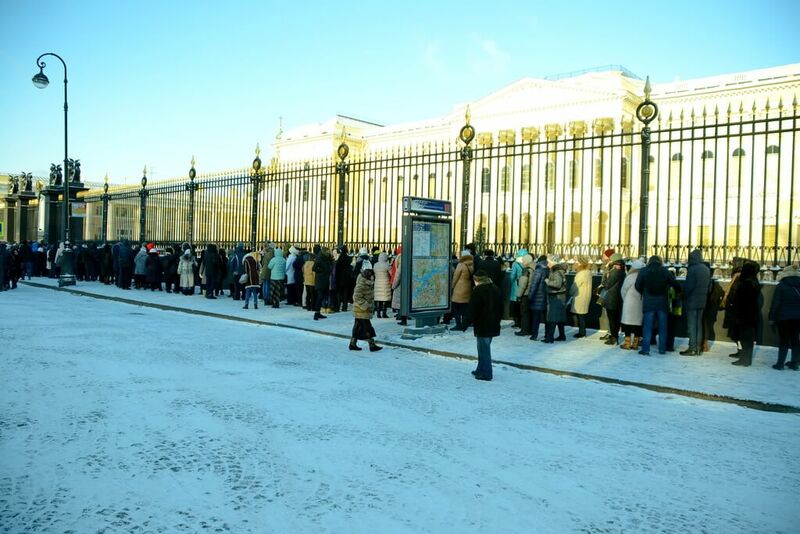 It’s even more surprising to see long queues for the biggest and most popular museums in St. Petersburg at the times when most people prefer staying home. The queue for The State Hermitage museum was no less than 300 meters long (including a part in an inner yard where the entrance to the museum is). You can see the queue on cover picture. The day on which the photo was taken was January 5, a free admission day which can partly explain the love for standing about an hour in line getting face, arms and legs gradually frozen. Though on Wednesday the queue was reported to be of the same length. The Russian museum is a bit less popular, but anyway has its own nearly one hundred meters line. The visitors are being allowed in by portions due to overcrowded space inside. Pictured also on January 5. The Catherine’s Palace featuring the Amber room has also a superb park that’s worth visiting at any time of the year (in the winter the entrance is free). Though we could not find strengths to join the queue to visit the museum as a 10 minute walk in the park on January 4 under -19 C urgently prompted us to a cup of coffee and half a liter of hot mulled wine at a nearby coffeeshop. And the camera’s battery had become low though it indicated a full charge before leaving out. That all is rather strange even for many Russians themselves, but true. We can offer only two explanations to why people prefer standing lined up for often over an hour wait to see arts and sometimes with kids (!). St. Petersburg is one of the most popular destinations within Russia for the long January holidays. Many people are coming here from across the country to visit museums which the city is well known for and not willing to miss the opportunity to attend the exhibition they have been dreaming of for years. The Hermitage is the museum number 1 in Russia, its name speaks for itself. The Russian museum now features the exhibition of Ivan Aivazosky with many paintings temporarily withdrawn from private collections, and you never know when you’ll be able to see such an exhibition again. The Catherine’s Palace has the Amber room which is a magnet for a lot of tourists. Another explanation was offered in the works by MIT’s professor Richard Larson also known as Dr. Queue. He writes that while some queues get us boring or nervous, others, he calls them «celebratory queues», don’t bring negative emotions as you stand for something you really want, for example, tickets for a rock concert. Or for an Aivazovsky or a Rembrandt. Anyway, a good picture for your Instagram is guaranteed.